Spending a Dime on Marketing! 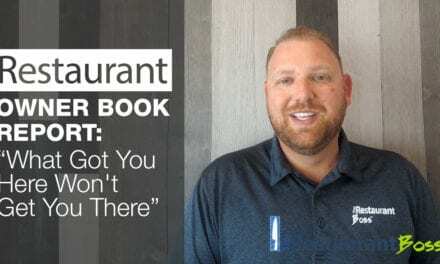 It’s book report time and this week, I am sharing a book that goes to the core of the restaurant business. 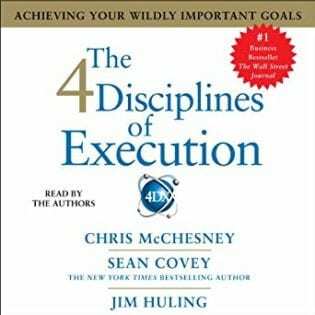 This book is The Four Disciplines of Execution by Sean Covey, Chris McChesney, and Jim Hulling. I hope you enjoy! Do you enjoy listening to books? I know I do...it's a great way to pass time while in the car or exercising. You can get a FREE TRIAL of Audible, my favorite way to listen to audio books, by clicking on the image to the right. 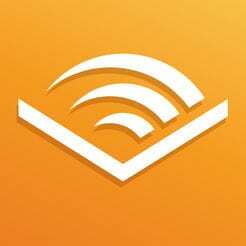 Once you grab your free Audible trial above, click on the book image to the left to listen for free. It’s a win-win! To learn more please either watch the video above, read the transcript or listen to the podcast below. Please Click the Message to Tweet! Today’s book report is on a great business book: Four Disciplines of Execution. The book has three authors: Sean Covey, Chris McChesney, and Jim Hulling. Sean Covey you might know from his father, Stephen Covey, who wrote Seven Habits of Highly Successful People. This book is not for the faint at heart; nor is it a weekend reading sitting by the beach and having a mai tai kind of book. This is serious business reading. Don’t get me wrong, it is a phenomenal book, but I found it much easier to listen to it on Audible. I’m going to be honest with you, this was a tough one to get through but it is incredible. I don’t think I’ve ever paused or bookmarked an audiobook more than I did this one for little nuggets of great information. The idea behind the Four Disciplines of Execution is that you have to execute. You’ve heard me talk about ideas before. Remember my famous quote, “Ideas are only 40% execution is the other 80%.”? What I mean by this quote is that coming up with great ideas is one part of the equation; executing them is the other. You have to execute on your ideas. Focus on WIG’s (Wildly Important Goal). The authors of this book, who have done a lot of studies on this, don’t believe that you could have six or seven goals in one year. Like myself, we all believe in having one goal, one wildly important goal. Make sure that you’re measuring LEAD MEASURES instead of LAGGING MEASURES. Lead Measures are the things that cause the other things to happen. A Lagging Measure might be something like lowering your food cost. A lot of us are measuring our food, beverage, or beer costs – that is a lagging indicator. The leading indicator might be a waste sheet, if we reduce waste the food cost is going to go down. A leading indicator might be better inventory or tighter ordering. If we measure our cans of beer everyday and make sure that no one is stealing our beer from us, our beer cost is going to go down. 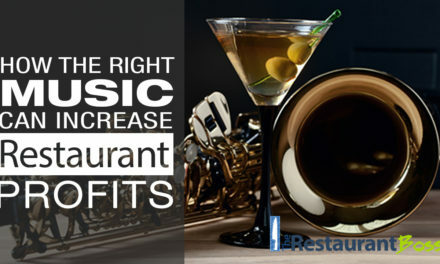 While a lot of us love to measure food, beer, or labor costs those are lagging measures. Start measuring your leading indicators instead of your lagging indicators. Keep score. Most of us don’t have any kind of a scoreboard. The analogy the authors use in the book is one of their children playing high school football. They were in the New Orleans area and went to a high school football game just after Hurricane Katrina. The scoreboard was out and nobody was paying attention to the football game. Instead, they were all having side conversations because without knowing the score the game is boring. They relate this scenario to your business. What is the scoreboard in your business? What are you measuring that’s important and where are you posting it for the team to see? Cadence of accountability. Cadence is like a rhythm. For example, when you ride a bike the RPM’s are the rhythm/cadence that you pedal. What is your rhythm or cadence of accountability? Are you very inconsistent in your accountability? Do you set goals with your team and then not check up with them and then every once in a while get angry or blow up because goals aren’t being met? Or do you have a daily check-in or weekly check-in? I know this is technical stuff and trust me the book gets even more technical than this, but it is incredible. It’s written by very respected people and a lot of the work that they do goes back to the hospitality industry. A lot of the business books I recommend don’t really go right to the restaurant business; they have a lot to do with business in general. These guys do a lot of work with Marriott, restaurants, hotels, and grocery stores. They cite their case studies and examples in the book. Have an absolutely wonderful day and I look forward to seeing you with another great video just like this next week. I hope this was helpful! I hope you loved it! If you did, will you go ahead and smash the little blue like button just below video. Will you also share this with your other restaurant friends? Tell them how awesome this video was so I can keep providing this great content for you at no charge. That’s the only way I am able to keep doing this. Please also leave a comment or ask me a question below this video. I promise to respond to you personally within 24 hours. If you are not already on my email list and would like to get great content delivered to your email box weekly, then please sign up for my email list! Have a wonderful Day! Subscribe to my channel for more free videos! Follow me to get daily updates and happenings! Its just kind of fun to tweet! Let’s share some beautiful pictures! There is a lot of cool stuff happening over here! Please leave your comments or questions below, I promise to respond to every one personally! 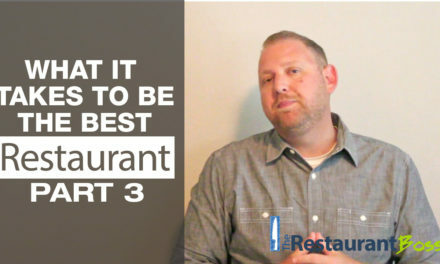 Ryan is the head trainer, coach & founder of The Restaurant Boss. 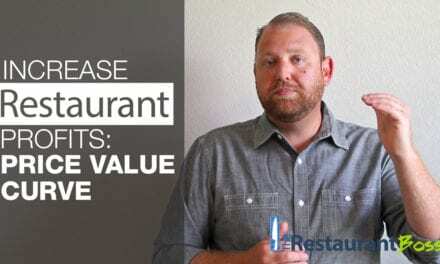 He works with clients all over the world to help them move from the stress, struggle and overwhelm of operating a restaurant to more money, more freedom and more joy of operating a restaurant business. For additional free training follow Ryan on your favorite social media sites.